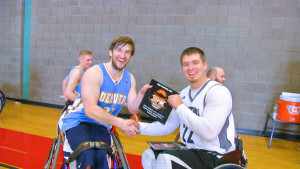 This month, All Star Video Sports was able to be a part of a sports tradition newer to the Kansas City area; competitive wheelchair basketball. 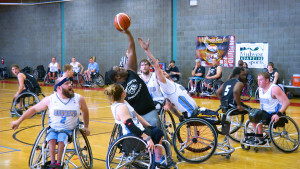 68’s Inside Sports, off of W 88th St. in Overland Park, was the host for the 3rd annual KC wheelchair basketball tournament this year, which included over 10 teams of highly competitive wheelchair basketball athletes. 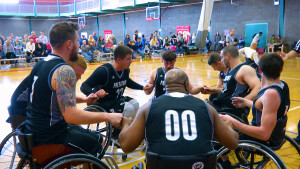 From late Friday night until early Sunday afternoon, some of the nation’s best wheelchair basketball teams and athletes got to compete against one another. All Star was able to shoot at the tournament from Saturday morning to Sunday afternoon, recording video of the various activities during the weekend, capturing interviews and game action highlights of all of the excitement. Getting to witness the type of game action that occurs during these basketball games was a thing to behold. Men and women competing at such a high level of athleticism, with only the ability to control their wheelchair and the ball, was quite amazing to watch. Witnessing athletes using only their upper bodies to streak across the court, maintain control of their large metal wheelchair, and gliding in to score the basket gave a sense of awe and amazement! Watching these paraplegic athletes compete was an inspiration, and something that we at All Star are proud to have been a part of. Seeing these athletes continue to follow their dreams and compete at such a high level of athleticism, was remarkable and enjoyable to watch.